I was lucky. My parents lived in the same house for forty-five years and they were always saving things: old daguerreotypes, tintypes, letters, notes, diaries, books, magazines, albums, gowns, and uniforms. History was alive in our attic. As kids my two sisters, brother and I played with period pieces: a brass medal of Admiral Dewey’s victory at Manila Bay (1898), and my great-grandmother’s Victorian gowns. Writing history papers in school was easy for a kid with original letters from the trenches and casualty clearing stations of World War I. Great Uncle William Gavin Johnston and his sister Annie Eliza Johnston (Argue) of Morden, Manitoba spent four years at the front, 1914-1918. William rose through the ranks from Private to Captain with the famous Princess Patricia Regiment Canadian Light Infantry (PPCLI #552). Annie carried an equally impossible burden as a nurse at Gallipoli and in Flanders. Their sister Maud, my grandmother, saved all their mail. Men of #2 Company, Princess Patricia’s Canadian Light Infantry, November 1915 at Place Vogel, Flixecourt, Picardy, France. Photographer: E. Daussey. Front (L-R): Harold E. Agar #748, William B. Crumb #568, Fred A. Pritchett #771. Back: Charles Little #772, William G. Johnston #552, Robert Western #772, Sydney Hawkbridge #522. Ms. Gwyn masterfully weaves the letters of seven Canadians into a history and a tale of the people, places, and tragedies of the Great War. Since reading her work, my grandmother’s writings and photographs of Manitoba, her brothers, sisters, and the war have become an obsession of mine. I have been researching ever since. Take, for example, the photograph of Great Uncle Will Johnston with his mates labelled “Place Vogel, Flixecourt 1915.” My cousin Grace White in Ontario sent it to me a few years ago. Uncle Will is standing, second from the left. But who are his mates? What and where is Flixecourt? What was going through the minds of these men as the photo was taken? I had to learn more. Fortunately, Uncle Will noted the names and regimental numbers of the men on the reverse side of the photo, so we know who they were. But what could I uncover about each of them? The place to begin is Volume II of the Regimental History of the PPCLI. The “Nominal Roll and Record of Service” provides details about each of the men. 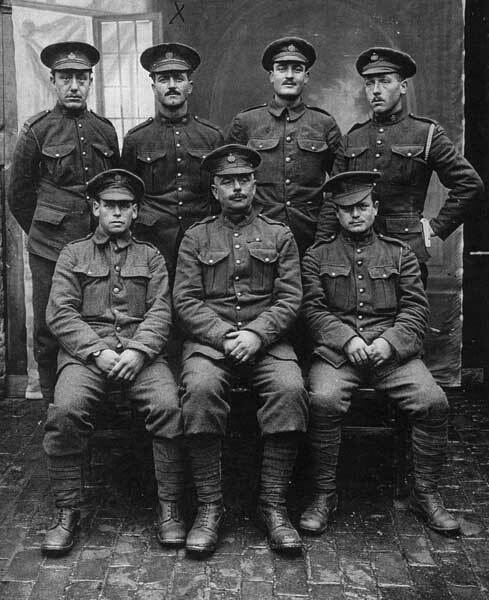 The link that binds them is that they were all members of #2 Company PPCLI. Adamson was a Captain as the war began, and he was the Regimental censor. He read all outgoing mail, removing any references to locations, military formations, and unit designations—anything that might be harmful should a letter fall into enemy hands. His men were cautioned not to frighten the folks at home with their letters, and not to take pictures. Adamson was ordered to confiscate all the cameras in his Company, so there would be little photographic evidence of the carnage. Fortunately, he did not censor his own letters with the same enthusiasm, leaving an unvarnished view of the war. Dear Sister: Just a few lines to you while I have the opportunity as it is not every day I have a chance to write. We are having a day or two of rest now and I rather think we need it. The trenches are everything not to be desired. The shell fire and chances of being shot don’t bother us anything like the hardships we have to put up with. The rain and cold water in the trenches—people talk (of the cold and hardships) in western Canada. Well, if you saw a regiment just relieved from the trenches, dragging themselves back to their billets it would give you some little idea of what we have to undergo here. Some of the men’s feet swell up so from standing in the mud and water so long that that their boots have to be cut off them. Our clothes are so soaked and muddy that it is an awful thing to get back out of the firing line. Some of the boys had to throw away their rain coats ... (But) I can stick it through if the others fellows can. This country will take a lot of building up again after the war as a lot of the buildings have been battered down by artillery; all kinds of property have been destroyed. Well, when you write me again please include an envelope and paper if you want a reply as it is impossible to carry writing materials with us without getting them wet. I don’t think I have any more news for the present. According to the Regimental History, in their first two months with the British Expeditionary Force, the Regiment suffered 50% casualties, 140 dead and some 400 hospitalized with pneumonia, typhus, rheumatism, and trench foot. Will Johnston’s medical records indicate that he spent the last week of January 1915 in the 6th Medical Hospital Rouen with a severe case of diarrhea. “It is beyond my powers to describe what has happened in the last 4 days ... We went in with 28 men after crawling in the mud for about a mile.” There were no trenches, just three blasted piles of sandbags, “compartments,” for his men to hide behind. No one could move during the daylight hours even to bury the dead, as the German lines were only ten feet away in places. Within his compartment Adamson counted the bodies of twenty-five dead Germans, British, and French who had been hastily buried in recent weeks, and then disinterred by artillery fire. At 2 AM the next morning (28 February) the Germans began flinging “hand bombs,” and filling the air with flares, mortar rounds, rifle, and Maxim gun fire. The Canadians could not show their heads above the sandbags for more than three seconds without facing certain death. At dawn the firing slackened and Adamson crawled along his lines, finding two dead and sixteen wounded. The men from #2 Company spent a second day returning rifle fire as best they could. At 5 PM eighteen replacements came forward and the injured were evacuated; one medic was killed and one wounded in the process. Adamson and his men lay in the freezing mud for another long night. And again, just before dawn (1 March) Adamson made the rounds of his positions, finding two more killed and four wounded. They spent another day in the freezing mud, returning the German fire as best they could. That night twenty more replacements came forward and the men who had spent three days and two nights in the freezing mud fell back to the reserve line of trenches. Adamson, however, stayed in the front line with his men the entire time. At forty-eight he was the oldest officer in the Regiment, and one of the most admired because he knew what was happening to his men; he was with them. On 2 March at 5 AM whistles blew and one hundred men of #3 Company PPCLI rose from their trenches to the left of #2 Company, struggled forward in the face of two German Maxim guns. For a few brief minutes they succeeded in clearing a section of the German trenches; but they could not hold it, and were soon chased back to their original positions. In the assault #3 Company suffered 36% casualties (eleven killed and twenty-five wounded). Adamson and his replacements spent another long day under heavy enemy fire. Fortunately the Germans had no idea how weak they were. By nightfall only one rifle was operational, the rest were jammed with mud and debris. At 2 AM (3 March) it began to snow heavily, and calm settled over the battlefield. Adamson waited until 6:30 in the evening and then gave the signal for the men to withdraw, leaving behind everything they had brought with them. One by one they crawled one hundred yards back thorough the mud, slipping over an embankment and into a waterfilled ditch that ran some five hundred yards towards their secondary line of trenches. In places the muddy water was six feet deep and the embankment had steep sides. The men had to swim through corpses of humans and horses. Just a few lines this time to let you know I am well, as I know you will be anxious about me as I suppose the papers will be giving out an account of the wonderful work done by us lately. We have been having some rough time of it and have been complimented on our work as we are holding our own along with the British line regiments. The rifle fire in the trenches does not annoy us as much as the mortars and hand grenades. At times the Germans are so near us, they can throw them right into our trenches. When they start off it’s just like waiting to be blown to pieces. So far I have not received a scratch, though men on both sides of me have been killed. Curiously, Adamson did spare his wife some of the details of their next encounter with the enemy, the Battle of Neuve Chapelle. According to the Regimental history, the attack began a week later in the predawn blackness of 14 March 1915. For more than 30 hours the Germans rained high explosives on the Allied trenches. Then, just as everyone thought it might be ending, they set off a single monstrous explosion. Enemy sappers (miners) had dug tunnels beneath the British lines, filled them of explosives, and blown a massive crater in the British lines. One of Will Johnston’s letters home. The litany of misery chronicled in the Regimental History continues: 19 March, Colonel Farquhar the Regimental Commander was killed at Voormeezle; 22 March, while encamped at Polygon Woods the camp suddenly filled with noxious fumes, the Germans had bombarded nearby Allied lines with poison gas, at the time the PPCLI were equipped with only “20 gas veils and a few frames for fans;” 12 April, the Canadian camp was bombed by German Zeppelins; and, 22 April, the Germans began another massive artillery barrage, launching the Second Battle for Ypres. I received your letter after it had been to France and followed me back. I was very glad to hear from you. I was wounded by shell splinters on May 5 and was sent over here. I was not severely injured at all and will be out in a week or so. Our regiment was nearly wiped out the day I was wounded. There were only 62 men and one officer left and I consider myself very lucky indeed to get off so lightly. We had to return two miles as the Germans tried to outflank us. There were 33 divisions of us holding trenches in a half circle when the enemy brought up reinforcements and nearly cut us off. So at night we retired back and dug ourselves in about 3 miles in front of the city of Ypres. The Germans seemed particularly eager to capture that city, as there is a straight road from there to Calais. We were in a sort of half circle but somewhat diminished. The Germans could sweep in from both sides and the front with their artillery, and they sure opened up something awful with all kinds of big guns. They even had heavy siege guns playing on our humbly made trenches, which knocked them practically to nothing. It was just murder. Men were buried alive, blown to pieces and we had to find shelter in shell holes, behind the dead, or any cover we could get. Reserves were constantly coming up but half of them were wiped out before they even got to us. The German infantry made several attempts to advance but were driven back each time till we were ordered to retire to the support trenches, as there was nothing left of the firing line. At night our men regained the front line trench again after a desperate bayonet charge. I do not know what happened after that. In fact I was wounded before the charge was made. The hospital behind the firing line is more like a slaughterhouse than anything else. Doctors are rushing around with sleeves rolled up, blood all over, giving the men their first dressing, digging the bullets and shell splinters out, or cutting off limbs that are hanging by the skin. They do not seem to be very gentle either, but when you consider the number that go through their hands, it is something remarkable how they go through so fast. Sometimes it is two to three thousand. I had a piece of shell in my chest the size of a marble and I did not have time to holler before he had it out. I have another piece in my thigh but it does not bother in the least and the doctor advised me to leave it there. What is left of the regiment is coming back to England to reorganize. It is reported that they may be sent to the Dardanelles if the war lasts another winter. I would prefer going there, as the wet and cold in Flanders is something cruel. I have had more shivers run up and down my skin in some of the trenches in one hour last January and February than I have ever had in Canada. You can just imagine, say in Manitoba in November, getting into a ditch with water and slush over your knees for 48 hours with never a hot drink and only cold water and biscuit and corn beef. I have been so weak that I had to throw away my rucksack and ammunition in order to get back to billet. They are usually four to six miles back. Lots of men were sent to the hospital with what they call frostbite, but it was just exposure as only a few mornings were there any signs of ice. It is surprising how the men keep up in spirit. No one except those who have the experience knows the terrible hardships that the troops have gone through. It is a great strain on a man as one is practically always under shellfire. The last three weeks ... we were right on the firing line and never out of range of the guns. Part of the time we were in a wood and every night we were shelled out. One night a shell exploded behind where I was sleeping and a splinter knocked the sights off my gun two feet above my head. We had no blankets those two weeks but that did not matter as long as it did not rain. However, I do not feel any the worse so far, and am in the best of health. If you write me at the previous address, and I am not there, it will follow me to the Folkstone Rest. Love to all. According to the Regimental History, Will Johnston and three of his mates in the Flixecourt photo (Harold Agar, Charles Little, and Fred Pritchett) were wounded in the fighting at Bellewaerde Ridge. In August the PPCLI were pulled back from the front lines to tend to their wounds and celebrate their first anniversary as a Regiment. By then thousands of young replacements were beginning to arrive from Canada. Over the summer the wounded “Originals,” the men who had been with the Regiment during its first year, began to rejoin their Companies. In November 1915 a handful of the “Originals” were withdrawn from the Regiment and sent to the Village of Flixecourt on the Somme where they bathed, slept on beds, and ate three hot meals a day. For two glorious weeks (8 - 22 November) Will and his mates helped train the new Canadian Third Army. At some time during that brief respite, probably on a Sunday afternoon, the seven survivors from #2 Company PPCLI strolled into Flixecourt and wandered around the main town square, Place Vogel. One of them spotted the studio of Monsieur E. Daussy, photographer. As a lark, they all gathered in front of his painted backdrop to have their portrait taken. Within weeks, as was the practice again and again, all seven were thrown back into battle. According to the Regimental History, Sydney Hawkbridge died at Sanctuary Wood 10 May 1916; Harold Agar was repeatedly wounded, promoted to Lieutenant, and then died at Passchendaele 30 October 1917. Robert Western’s health failed in December 1915, Charles Little’s in March 1916, Fred Pritchett’s in October 1916, and they were “SOS” (Separated from Service). Only two of the seven were still in uniform when the war ended on 11 November 1918: William Crumb and great uncle William Gavin Johnston. Uncle Will’s military and medical records read like a history of WWI: Ypres, Neuve Chapelle, Bellewaerde Ridge, the Somme, Sanctuary Wood, Courcelette, Vimy Ridge, and Passchendaele. During the four horrible years between 1914 and 1918 he fought, was wounded, hospitalized, and returned to the front repeatedly. In the process he received battlefield promotions to Corporal, Sergeant, Lieutenant, and Captain; he received a military medal for his actions on 16 September 1916 at Fabick Graben trench, the main German line of defence at the Battle of Courcelette (London Gazette 9 December 1916, #29854). How would Will Johnston label that photograph taken at Flixecourt in November 1915, “Survivors of Ypres before the Somme?” What would he say about the four years of madness from 1914 to 1918? Surely he would agree that it was the worst of times, and these were Canada’s finest. 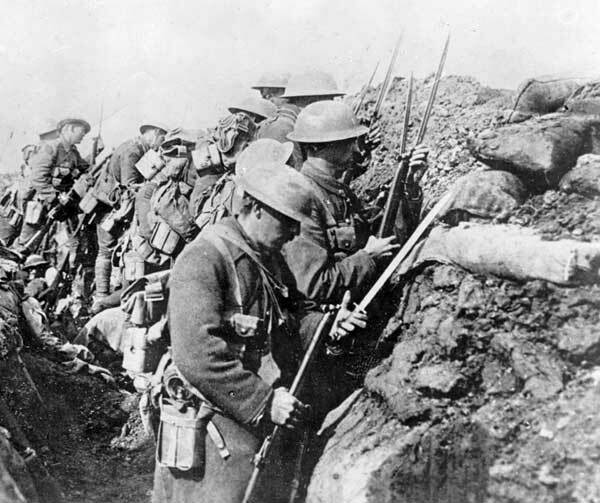 Trench-bound Canadian soldiers fasten bayonets to their rifles in preparation for a charge, France, September 1916. Source: Archives of Manitoba, World War I, #91. As well as the private papers of my grandmother Rachel “Maud” Johnston and her family, especially Grace White, James and Irene Blight, I have relied on the following sources for background information: Ferguson, N., The Pity of War. Perseus, New York: Basic Books, 1999; Groom, W., A Storm in Flanders - the Ypres Salient 1914-1918: Tragedy and Triumph on the Western Front. New York: Grove Press, 2002.; and Keegan, J., The First World War. New York: Vintage Books, 2000. 1. Gwyn, S. Tapestry of War: A Private View of Canadians in the Great War. Toronto: Harper Collins, 1992. 2. Hodder-Williams, R. Regimental History of the Princess Patricia Regiment Canadian Light Infantry, vols. 1 & 2. Toronto: Hodder & Stroughton, 1921. 3. Christie, N.M. ed. 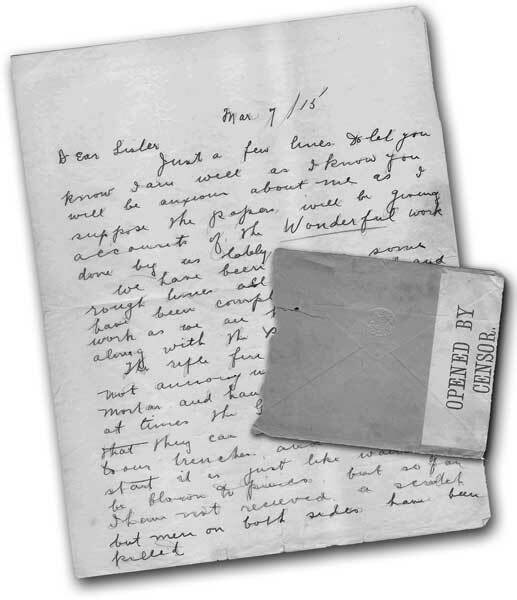 Letters of Agar Adamson 1914-1919. Nepean, ON: CEF Books, 1997.